1950's vintage full skirted halter party dress. Weighty teal black corded silk taffeta. The engineering of this design relies on the substantial weight of the fabric. Boned bodice is fitted with darts that form deep V center front. Full circle skirt with pieced wide flare pleats at front with inverted pleat at center effecting mitered cord look. Pieced wide flare pleat center back. Center back metal zipper closure, bottom covered by pleat that attaches over the top. 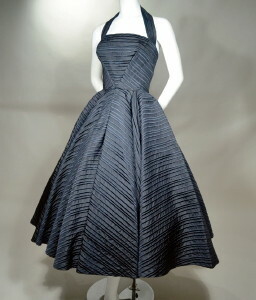 This dress was most assuredly created in a high end house by some brilliant couturier, but alas, sadly has no label. No matter... an exciting addition to any serious collection! Skirt length, measured back from waist seam to hem edge - 32"